Two years ago, my American counselor showed me a video of an occupational therapist helping a child with a disability. Eager to help people in need, I was fascinated by this job and started to read various articles about OT. In the following year, to gain a deeper understanding of OT, I shadowed an occupational therapist in a health center in Cincinnati. This experience made me totally fall in love with Occupational Therapy and thus I decided to major in it during college. 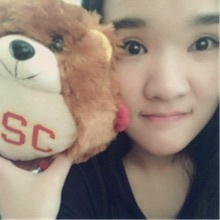 I was born and raised in China and only visited the U.S. twice before entering USC. In the first week of school, I had a welcome dinner with all the OT freshmen and professors. As the only international student this year in this program, I received lots of help and kindness, which made the dinner memorable. Lots of cookies and cheese cakes! I wish I could fly super fast, so that I wouldn’t need to buy expensive plane tickets to go back home.